Voluntarily and intentionally abstaining from something that is good and acceptable for spiritual purposes…such as prayer, worship and seeking God. Bodily discipline contributes to spiritual discipline (and other discipline). The discipline of fasting increases our ability to be emotionally and spiritually disciplined—to say “no” to sin and “yes” to holiness. It’s like kids learning to eat healthy. The more they indulge their sweet tooth with sugar and unhealthy foods, the more their appetite will be formed to desire them. Trying to get a child to eat vegetables when they have been raised on a diet of pizza and sodas is a challenge. When we engage in the discipline of limiting sugary, unhealthy foods openness to healthier fruits and vegetables is more likely. What is true about our physical appetites is related to our spiritual appetite. If we’ve trained ourselves to desire spiritual junk food, our desire for healthy food is diminished. One way to train our souls and our bodies to desire good spiritual food is to abstain from the “junk” for certain periods. Do you want to break the hold of sin in your life? Fasting contributes to that. In conjunction with other disciplines like prayer and silence and solitude, we can find that those controlling desires lose some of their control. Jesus was speaking to Satan to counter the temptation to glorify himself or glorify Satan as opposed the God the Father, who alone is to be glorified. 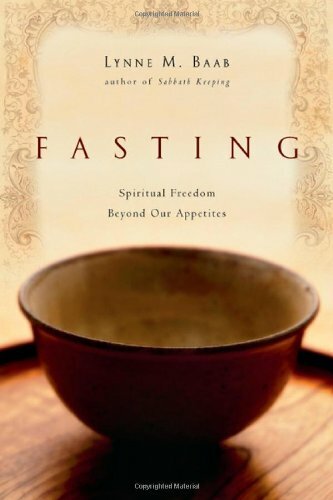 Our fasting is also intended to deny glorification of ourselves and the enemy (through any cultural or social temptation) and to glorify God the Father who alone is worthy of our worship. For clarity in thinking, feeling, praying, hearing, etc. Choose a type of fast: from food, technology, TV, media, etc. Choose a length: half a day, full day, one meal, two days, etc. For those beginning a fast from food, I’d suggest starting with two meals (breakfast and lunch). You would eat dinner in the evening and begin your fast immediately follow and fast until dinner the next day, so a total of about 24 hours. What do I do during my fast? Focus on God. Read scripture or a devotional book, pray and turn your thoughts to God. This is especially important for the time that you would have spent eating, watching TV or on the computer. Re-focus your time and energy to God.